Russian President Vladimir Putin meets with Japanese Prime Minister Shinzo Abe on the sidelines of the APEC summit in Beijing. Japan has grown increasingly wary of Russian provocations directed against it, Japan’s ex-defense minister told an audience at a Washington, D.C.-based think tank Wednesday. Since Japan’s support of sanctions against Russia last year following Moscow’s annexation of Crimea, Itsunori Onodera, who served as Prime Minister Shinzo Abe’s defense minister until late last year, said Tokyo had noted what he termed a dramatic change in Russian behavior. Russian ships were detected close to Japanese waters with increasing frequency, while Japanese jets had scrambled against Russian aircraft amid a notable rise in flights, exercises, and training near Japan. “We are doing it against Russia more than any other country,” Onodera said following an address at the Henry L. Stimson Center. According to Japan’s defense ministry, during the last fiscal year which ended in March, Japan’s fighter jet scrambles had reached Cold War-levels partly due to the surge in numbers against Russian aircraft. Though recent quarterly figures showed a sharp slide in the number of air maneuvers directed against Russian planes, officials have said that it ought not to be equated with a slowdown in Russian military activities in the region more generally. Onodera’s comments come amid a new round of decades-old bickering between Moscow and Tokyo over four disputed Pacific islands which have strained ties since the end of World War Two. In June, days after Abe became the first Japanese prime minister to visit Ukraine, Russia announced that it would speed up the construction of military facilities in what it calls the Southern Kuril islands. And just last month, Japan fiercely protested Russian Prime Minister Dmitry Medvedev’s visit to one of the islands and postponed a planned visit by its foreign minister Fumio Kishida. Onodera noted that Japan had demonstrated solidarity with the United States and European states to sanction Russia even though it meant “sacrificing” Tokyo’s more narrow self-interest to have the Northern Territories returned to it. He also emphasized that it was important for Japan to maintain consistency with respect to sovereignty questions as its stance could also potentially influence other issues like the ongoing row with China over the Senkaku/Diaoyu Islands in the East China Sea. The growing tensions between Moscow and Tokyo have poured cold water on a potential summit this year between Abe and President Vladimir Putin of Russia. 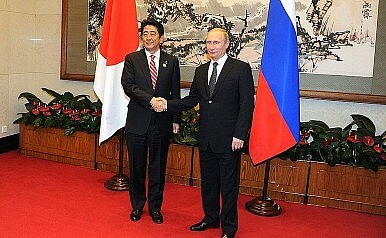 Sources told The Japan Times recently that while it may be possible for Kishida to visit Russia by the end of 2015 and for Abe and Putin to meet on the sidelines of the U.N. General Assembly in New York later this month, a visit by Putin* at this stage would be difficult given political realities. Japan has officially logged protest with Russia over the construction of military barracks on the disputed island chain.